re you looking for a great choice when it comes to a hand held shower head? Well, you do not have to look any further. Speakman Caspian VS-3-14 Multi-function can do for you. It is equipped with some of the best features and specifications making it foremost choice for home and hotel owners who wish to add some touch of both modernity and transition. This elegant transitional handheld shower is specially designed to for enhanced performance. It features five plungers (or jets) capable of delivering up to 45 sprays. Combined with the 12 center massage jets, these features are capable of transforming your shower water into more than 50 full coverage currents. The resultant showering experience is not like any thing you already know. 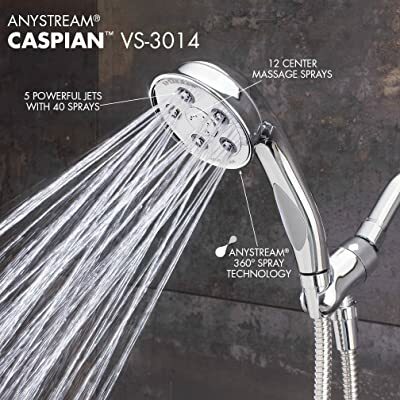 It is also equipped with patented Anystream 360-degress technology allowing the users to transition through combination spray, intense and massage spray patterns. The main demerit of this showerhead is associated with a component that the manufacturer calls flow regulator.’ This component tends to lower pressure to a level that is way below 2.5 GPM. Installation is very easy. You do not need any specialized plumbing tools. To not worry about worry if you if you do not have any plumbing skill because they are not necessary. The only ability you are required to have is read, understand and apply. Looking very elegant, this showerhead is designed to enhance bath fixture décor. Each unit comes with 60-inch metal hose and bracket for optimal maneuverability during showering. You also do not have to worry about weight because the unit features strong but lightweight plastic for durability. It is also ergonomically designed to reduce strain and thereby enhance comfort of use. Its innovative design makes the handheld shower very easy to use by almost anyone capable of using a bathroom. It is lightweight thanks plastic construction while the hose is made of metal to promote longevity. The showerhead is very easy to install, you do not need any special skills or specialized plumbing tools. It is also certified for environmental friendliness to energy conservation. Inasmuch as the showerhead is designed to avoid leaks, many customers have complained of leaking. It does not deliver water at high pressure, which may not be ideal for consumers. There is no better way to enhance the interior décor of your bathroom other than to install a modern and transitional bath fixture such as Speakman Caspian VS-3014. It will give you good value for your money. It is equipped with wonderful features and specifications that make it a good performer that is extremely easy to install.